The Global Change Institute, where Ove is based is focused on research, ideas and advice for solving the challenges of a rapidly changing world, and is focused in four main themes: healthy oceans, food security, sustainable water, and clean energy. Ove is also the most cited author in the peer-reviewed literature on the impacts and influence on the world’s oceans. 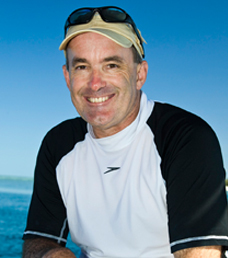 In addition to leading a major research group at the University Queensland on coral reefs and climate change, he is the Coordinating Lead Author for the regional ‘Oceans’ chapter for the Fifth Assessment report of the Intergovernmental Panel on Climate Change (www.ipcc-wg2.gov) and chair of the Blue Ribbon Panel for the Global Partnership for Oceans. He has been awarded a Eureka Prize for his scientific research, the QLD Premier’s Fellowship, and is currently an ARC Laureate Fellow. Ove is a member of the Australian Academy of Science and in late 2014, was awarded the Prince Albert II of Monaco Climate Change Award.